Native Instruments Maschine was originally released in 2009. The deep integration between hardware and software converted many Akai MPC users from the standalone hardware platform. The switch was easy for many to make, the Maschine software offers both standalone and plugin options – use it to create elements of your track within your favourite DAW or build the entire track in the simple to use software. 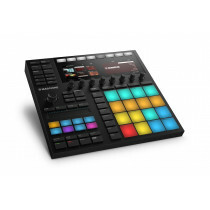 Recognising the success of Maschine, NI released the original Mikro in 2011, around the same time iMaschine was also released – opening the Maschine world up to even more users. A MK2 version of Maschine would follow in 2012 before Native Instruments released the, then, flagship Maschine Studio in 2013. The Maschine Studio offered users of the Native Instruments Maschine platform large screens and almost completely removed the need to look at the computer screen. Track browsing, sample and instrument selection was streamlined, in fact the entire workflow became smoother. iMaschine 2 was released in 2015, satisfying the hunger of many users of iOS devices by improving the feature set further. 2016 would see the announcement of the Maschine Jam, a clip launch tool with 8 touch-strips and a new workflow for the Maschine user base. In 2017 the Maschine MK3 was unveiled, with new high-resolution screens, larger pads, a touchstrip for enhanced playability and a studio quality audio interface built in. The Maschine software has now evolved into a versatile production tool, with chord sets, one pad chord and scale functionality to remove writers block and inspire creativity. Now, in 2018, the Maschine Mikro MK3 has arrived – inheriting many features from its big brother while making the work of Maschine even more accessible thanks to the new lower price point. 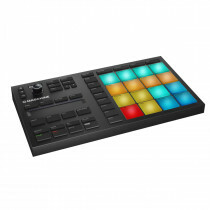 Weighing in at less than £200, new Maschine Mikro MK3 packs a serious production punch for not a lot of money! Read more.